Even Senegal's greatest ever team, one that has just finished a World Cup campaign that even its biggest fans would never have dreamed possible, is not above criticism. 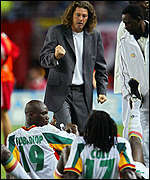 In particular Bruno Metsu has been on the receiving end of some tough talk from the Senegalese press and fans following the Lions' quarter-final defeat to Turkey. The Senegalese bone of contention is this: they believe that Metsu should have made changes to what was an obviously exhausted team on Saturday. Writing in the main daily Le Soleil, Khalifa Ndiaye notes that the Turkish coach made two substitutions, one of whom scored the winning goal. "Bruno Metsu should have done the same with his squad by taking out one or more of his main players," Ndiaye wrote, suggesting that the likes of EL Hadji Diouf, Khalilou Fadiga and Salif Diao looked tired and were prime candidates for a spell on the bench. Cheikh Tidiane Biteye, the coach of Senegalese league side AS Douanes, was even more explicit in his analysis. "There are things that have to be said, and I think that the Auxerre midfielder Amdy Faye, who was on the bench, should have come in," he argued. Senegalese fans were equally convinced that substitutions should have been made. "All our players were knackered, you could see that," said Youssou in Osaka. "I can't understand how Metsu didn't change things round." The harshest critic of all was former international Babacar Louis Camara. "It is horrible to say it, but we were beaten because of bad coaching," Camara told Le Soleil. It should, however, be pointed out that the Lions' relationship with the press has often been stormy, and many players boycott their compatriot journalists. As one player told me in private, "I cannot believe how they criticise us, and particularly Bruno." "In 10 years time they will look back on this as the golden age of Senegalese football and we will all be seen as heroes."